Body Blitz Blog: Welcome to the East Side! Welcome to the East Side! During our body blitz west shutdown, come visit us on the east side. Body blitz east is in the heart of Corktown, one of the oldest neighbourhoods in Toronto. Constructed largely in the first half of the 1800’s, the area housed immigrants who worked at distilleries, factories and brickworks nearby. 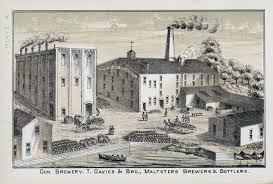 The name ‘Corktown’ is believed to have come from two possible sources: from its earlier inhabitants, many of whom emigrated from Country Cork in Ireland and the prevalence of cork stoppers needed to plug the bottles at the nearby breweries. In the early 1960’s, the Gardner Expressway and Eastern Avenue overpass were built demolishing part of Corktown and eventually giving rise to a series of car dealerships and mechanics in the area. Among the historic buildings still standing are ‘Little Trinity Church’ on King St. East, built by low-income residents in 1843 to avoid paying lofty pew rents at the city’s Anglican Cathedra. The Trinity Schoolhouse on Trinity Street was built in 1848. This was Toronto's first 'free school'. Its benefactor was Enoch Turner, a prominent Corktown brewer, and one of Toronto's great philanthropists. Today Corktown is being revitalized and is home to TheDistillery District, Corktown Common, the future 2015 Pan Am/Parapan Am Games and of course body blitz east. We are thrilled to be part of the neighbourhood.